Introduction. 1. Anti-insect agents. 2. Acaricides. 3. 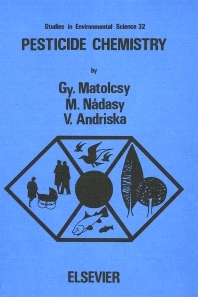 Nematocides. 4. Rodenticides. 5. Fungicides. 6. Herbicides. Subject Index. This book provides an overview of the major chemical aspects of pesticides giving detailed descriptions of the various groups of pesticides in current use - insecticides, acaricides, nematocides, rodenticides, fungicides and herbicides. The organic syntheses are discussed in detail, as are the biochemical aspects of the effectiveness and mechanisms of action of these chemical agents. The ecological aspects of the use of pesticides - nowadays an important consideration - are also discussed. The main trends of development in the field are also dealt with, e.g. the development of insecticides which present less of a threat to human beings and animals than the ones presently used, whose point of attack is the nervous system. Research is now concentrated on developing chemical compounds which affect the biochemistry or the special behavioural features of insects, instead of acting upon their nervous system. Newly discovered chemicals with selective action which are still in the developmental and experimentational stages are also described. Because of its comprehensive character, the book will be a useful source of information to those engaged in practical work in this field, as well as to researchers in the agricultural sciences.